Take one of many direct regional flights to Keflavik international airport in Iceland. On arrival take the complimentary transfer to the Northern Light Inn, located just 15 minutes from the airport and next door to the Blue Lagoon. During the months of June, July and August, the Blue Lagoon is open until 10pm, so there is the opportunity to relax in the milky blue waters under the midnight sun before retiring for the night. Enjoy a leisurely breakfast and for those who did not do so last night, there is the opportunity to visit the Blue Lagoon. The nearby town of Grindavik offers horse-riding and 4X4 ATV/Quad tours should you wish for a more adventurous monrning. Lunch (pay locally) and return to Keflavik international airport for your afternoon flight to Narsarsuaq in South Greenland. As you approach Greenland make sure you peer out of the window. If the skies are clear, you will be rewarded with dramatic views of the ice-cap which covers 80% of the country, as well as the monolithic ice-bergs that lazily drift along the fjords and pepper the sea. On arrival, make your way to the pier for the transfer to Narsaq. With no roads linking towns and settlements, this is your first introduction to the local transportation. You will travel by boat along Eric’s fjord to Narsaq, 1 hour away, perhaps even dodging the odd iceberg along the way. It is at Narsaq you will meet the local destination guide and check in to the Hotel Narsaq, your base for the following 3 nights. 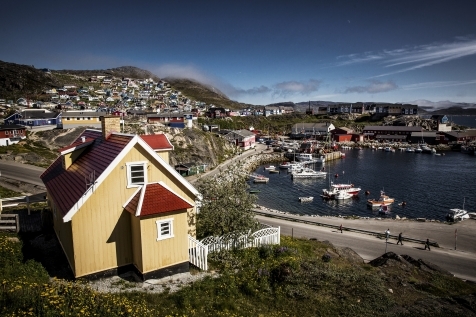 A tour briefing is followed by a guided walk around this typical Greenlandic town (pop.1500). 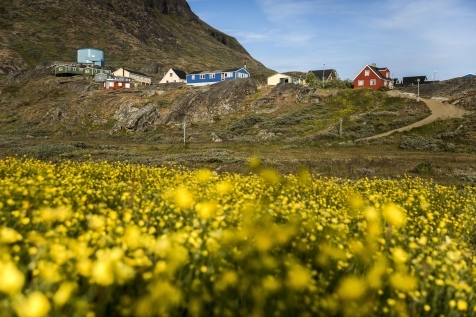 Small wooden houses painted bright colours cling to the shores of Narsaq Sound, which home to glistening icebergs that suspended in the deep blue waters. The day finishes with a welcome dinner and the chance to get to know your fellow like-minded travellers. After breakfast, you will head by boat on to Qarqotoq, 45 minutes away and the biggest town in South Greenland with a population of just over 3000. This is a town of contrasts. Founded in 1775, old colony houses cluster around a century old fountain, whereas newer properties rise up amongst the surrounding mountains. Some 40 sculptures crafted by artists from all the Nordic countries are scattered throughout the town and surrounds, and the museum presents an eclectic mix of modern art and classic Greenlandic cultural expressions. Check in to the Hotel Qarqotoq, after which you will join a guided walk around the town. Dine at your convenience (payable locally). Today is at leisure. Alternatively, pick one of the optional additional excursions on offer. 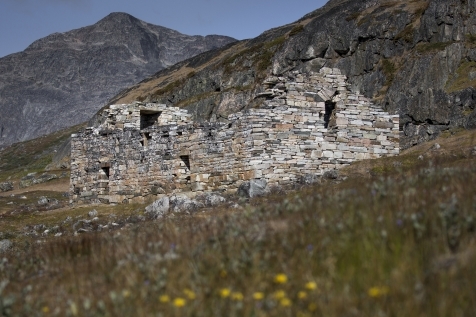 Hike round the big lake ‘Storesøen’ or visit the old Norse ruins at Hvalsey. Take boat trip to the hot springs at Uunartoq and enjoy the contrast of bathing in a natural ‘hot-tub’ whilst watching the icebergs floating past. Alternatively, travel by boat to the nearby twin glaciers and, weather permitting, witness their immense power from ground level. 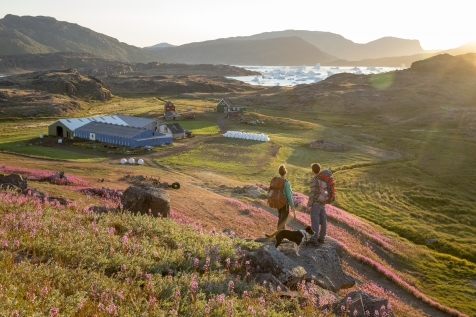 Finally you could join a local Greenlandic family for coffee and cake and hear first-hand about living in a land so isolated from the rest of the world. There is a wealth of optional excursions on offer from Narsarsuaq. Visit the ruins of Eric the Red’s farm and Thorhildur’s church. Enjoy some soft adventure with a RIB boat ride to visit Viking ruins, followed by 4x4 trip to Tasiusaq, where seven people live in almost complete isolation , then after lunch, kayak in the Iceberg Bay! Cruise between the sculpted icebergs calved from the Qooroq Glacier or hike to the ice cap itself. This evening enjoy a farewell dinner at the Hotel Narsarsuaq in the company of your fellow travellers. Enjoy breakfast together with a farewell coffee with your guide. Depending on the time of your departure flight there may be time to squeeze in some more sightseeing before heading to the airport for the return flight to Keflavik international airport in Iceland. Take the short transfer to the conveniently located Northern Light Inn, where you will have time to reflect on your adventure. At leisure until such time you need to transfer back to Keflavik for your return flight home. Should you wish to spend some more time exploring Iceland, then we can easily tailor your break to incorporate extra days in Reykjavik or beyond, either pre or post the trip to Greenland.